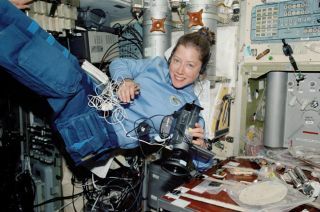 NASA Astronaut Pamela Melroy, STS-112 pilot, holds camera equipment as she floats in the Zvezda Service Module on the International Space Station (ISS) in October 2002. Astronaut PamelaMelroy, a two-time shuttle pilot, will become the second woman to command aNASA shuttle when she leads the upcoming STS-120 mission to the InternationalSpace Station (ISS), the space agency said Monday. Melroy, aU.S. Air Force colonel hailing from Rochester, New York, will command a crew ofsix astronauts charged with delivering a new connecting node to the ISS. Builtfor NASA in Italy, the Node2 module will serve as a link between other habitable space stationcompartments. Joining Melroyon the STS-120 mission - currently the fifth shuttle flight to fly after NASA'sSTS-121spaceflight launches next month - are pilot GeorgeZamka, mission specialists ScottParazynski, Douglas Wheelock, MichaelForeman and Italian astronaut Paolo Nespoli of the European Space Agency(ESA). Melroy isonly the second female astronaut to command a U.S. orbiter after shuttleveteran EileenCollins, who led NASA's STS-114return to flight mission in 2005 and retired inMay 2006. Collins first commanded a shuttle mission in 1999 after serving aspilot on two previous flights. Selected tojoin NASA's astronaut corps in 1994, Melroy served as shuttle pilot aboard theDiscovery orbiter during STS-92,an ISS construction mission that launchedon Oct. 11, 2000. She also served as pilot for the STS-112shuttleflight aboard Atlantis during its ISS-bound mission in 2002. Melroy joinedthe U.S. Air Force in 1983 after earning a degree in physics and astronomy fromWellesley College. She also earned a master's degree in Earth and planetarysciences from the Massachusetts Institute of Technology in 1984, NASA said.